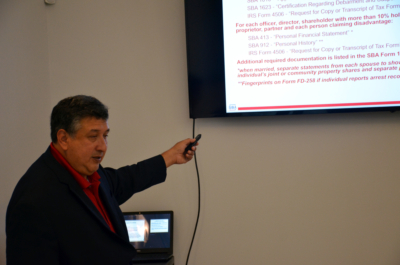 SBA Business Opportunity Specialist Gilbert Soliz Jr. explains both the ins and outs of the 8(a) Business Development Program on Sept. 6 at the Brownsville Chamber of Commerce. 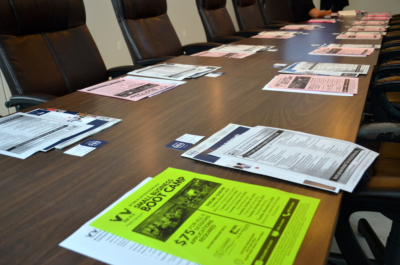 The U.S. Small Business Administration is an invaluable resource for any new entrepreneur. The 8(a) Business Development Program began as a public law and was named after Section 8(a) of the Small Business Act of 1953 (Section 204 of Public Law 100-656). The program’s incorporation took place in 1984 in Part 19, Small Business Program of Federal Acquisition Regulations (FAR). Specifically, the program is a creation for businesses to work with government contracts. On Sept. 6, the Women’s Business Center of Cameron County hosted a seminar to inform local businesses on the 8(a) Business Development Program. Business Opportunity Specialist for the U.S. Small Business Administration Gilbert Soliz Jr. was on hand to give information. Soliz shared that the program’s objective is to provide small businesses opportunities, as well as promote the business development of small businesses owned and controlled by socially and economically disadvantaged individuals. Socially disadvantaged individuals are persons who have been subject to either racial or ethnic prejudice or cultural bias; Black American, Asian Pacific American, Hispanic American (Spanish and Portuguese descent), Native American and Subcontinent Asian American. Persons not members of the groups of designation must establish a preponderance of evidence of discrimination or bias for the 8(a) Business Development Program. Evaluations are on a case by case basis. It’s a requirement to be a citizen of the United States to quality. Economically disadvantaged individuals are socially disadvantaged persons whose ability to compete in the free enterprise system has been impaired due to diminished capital and credit. There is a net worth criteria to qualify for the 8(a) Business Development Program. After excluding both the individual’s equity in the firm and equity in the primary residence, net worth may not exceed $250,000. Once net worth exceeds $750,000, you’re out of the program. SBA is waiting for hear back from Congress on the decision to raise the net worth limit to 1 million. Part of the eligibility criteria is to also show good character. Persons who report false information, hold outstanding balances with student or federal loans, or hold any criminal charges will not be eligible. The person applying for the 8(a) Business Development Program must hold the position of president, CEO, managing partner or member and own at least 51 percent unconditional control of the company. They must be the highest paid individual and have the ability to hire and fire. They must also set policies for the company and have the ability to commit to contracts. Additionally, they must control the budgets and financials of the company. The goal of the program is to help you grow and eventually wean off. “If you do a good job, they’re (the government) going to ask you to come back. It’s a vehicle to get you in the government contracting arena,” said Soliz. It’s important to note that an individual maybe only participate in the program once, even if ownership and control has changed, and even if the individual starts another company. A company must have been operating for two years to qualify. Once an individual submits an application, the process will take at least 90 days. Applications are taken all year. For more information about the 8(a) Business Development Program, visit sba.gov/8abd.